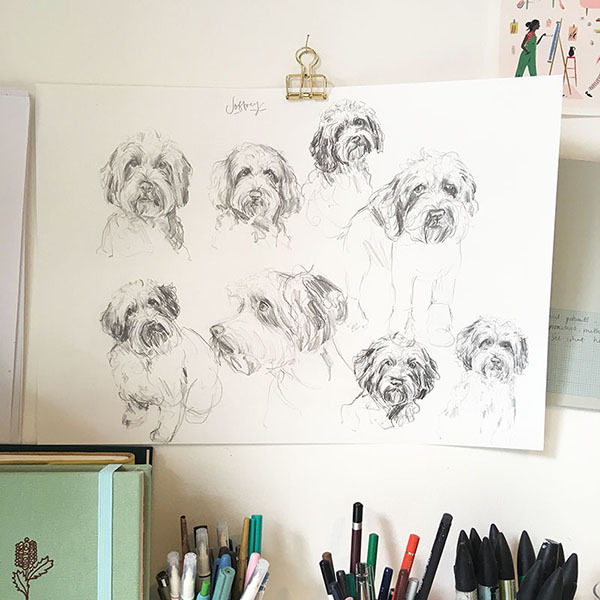 I’ve been busy working on a brand new style for my Pet Portraits, keeping it simple and working in Pencil. It’s been a really nice change to work like this - challenging myself and exploring my drawing skills again. I’ve been working predominantly in gouache over the last couple of years, and only used pencil for rough sketches. There’s just so much more you can do with pencils! The main thing for me when working in pencil is to focus on contrasts. Contrasts between light and dark tone, as well as different types of line. I’ve re-discovered my love for putty rubbers too! And a regular rubber as well, using them to really pick out highlights and accentuate texture. It’s very different to working in paint, but the principals of working in layers is quite similar. As I’ve always done, I start every portrait by doing several quick, scribbly sketches on a big sheet of paper. Sometimes these are my favourite drawings! When I work quickly I don’t get fixated on tiny details, or making things look precisely how they do in the photo of the pet I’m drawing (something I can get obsessive over in more finished pieces!). It’s freeing to work in such a loose way. This is part of the reason I wanted to start doing pencil-portraits, to bring some of that loose-ness back into my finished drawings. It was a bit difficult at first to try and strike that perfect balance of loose-ness and detail - enough of both to achieve both a good likeness and a sense of energy. I’m always working to get this balance right in my portraits, in both pencil and paint. I’m really happy with how the pencil-portraits have turned out so far, and I look forward to doing even more! Here are a couple more, and you can see the rest by clicking here, and also find out how to order one here.